Real and Pseudo Gold Standards: Could Friedman Tell the Difference? One of the first academic papers by Milton Friedman that I read was “Real and Pseudo Gold Standards.” It’s an interesting paper presented to the Mont Pelerin Society in September 1961 and published in the Journal of Law and Economics in October 1961. That it was published in the Journal of Law and Economics, then edited by Friedman’s colleague at Chicago (and fellow Mont Pelerin member) Ronald Coase, is itself interesting, that estimable journal hardly being an obvious place to publish research on monetary economics. But the point of the paper was not to advance new theoretical insights about monetary theory, though he did provide a short preview of his critique of Fed policy in the 1920-21 Depression and in the Great Depression that he and Anna Schwartz would make in their soon to be published Monetary History of the United States, but to defend Friedman’s pro-fiat money position as a respectable alternative among the libertarians and classical liberals with whom Friedman had allied himself in the Mont Pelerin Society. Although many members of the Mont Pelerin Society, including Hayek himself, as well as Friedman, Fritz Machlup and Lionel Robbins no longer supported the gold standard, their reasons for doing so were largely pragmatic, believing that whatever its virtues, the gold standard was no longer a realistic or even a desirable option as a national or an international monetary system. But there was another, perhaps more numerous, faction within the Mont Pelerin Society and the wider libertarian/ classical-liberal community, that disdained any monetary system other than the gold standard. The intellectual leader of this group was of course the soul of intransigence, the unyieldingly stubborn Ludwig von Mises, notably supported by the almost equally intransigent French economist Jacques Rueff, whose attachment to gold was so intense that Charles de Gaulle, another in a long line of French politicians enchanted by the yellow metal, had chosen Rueff as his personal economic adviser. What Friedman did in this essay was not to engage with von Mises on the question of the gold standard; Friedman was realistic enough to understand that one could not reason with von Mises, who anyway regarded Friedman, as he probably did most of the members of the Mont Pelerin Society, as hardly better than a socialist. Instead, his strategy was to say that there is only one kind of real gold standard – presumably the kind favored by von Mises, whose name went unmentioned by Friedman, anything else being a pseudo-gold standard — in reality, nothing but a form of price fixing in which the government sets the price of gold and manages the gold market to prevent the demand for gold from outstripping the supply. While Friedman acknowledged that a real gold standard could be defended on strictly libertarian grounds, he argued that a pseudo-gold standard could not, inasmuch as it requires all sorts of market interventions, especially restrictions on the private ownership of gold that were then in place. What Friedman was saying, in effect, to the middle group in the Mont Pelerin Society was the only alternatives for liberals and libertarians were a gold standard of the Mises type or his preference: a fiat standard with flexible exchange rates. It is vitally important for the preservation and promotion of a free society that we recognize the difference between a real and pseudo gold standard. War aside, nothing that has occurred in the past half-century has, in my view, done more weaken and undermine the public’s faith in liberal principles than the pseudo gold standard that has intermittently prevailed and the actions that have been taken in its name. I believe that those of us who support it in the belief that it either is or will tend to be a real gold standard are mistakenly fostering trends the outcome of which they will be among the first to deplore. This is a sweeping charge, so let me document it by a few examples which will incidentally illustrate the difference between a real and a pseudo gold standard before turning to an explicit discussion of the difference. So what were Friedman’s examples of a pseudo gold standard? He offered five. First, US monetary policy after World War I, in particular the rapid inflation of 1919 and the depression of 1920-21. Second, US monetary policy in the 1920s and the British return to gold. Third, US monetary policy in the 1931-33 period. Fourth the U.S. nationalization of gold in 1934. And fifth, the International Monetary Fund and post-World War II exchange-rate policy. Just to digress for a moment, I will admit that when I first read this paper as an undergraduate I was deeply impressed by his introductory statement, but found much of the rest of the paper incomprehensible. Still awestruck by Friedman, who, I then believed, was the greatest economist alive, I attributed my inability to follow what he was saying to my own intellectual shortcomings. So I have to admit to taking a bit of satisfaction in now being able to demonstrate that Friedman literally did not know what he was talking about. Friedman’s discussion of monetary policy after WWI begins strangely as if he were cutting and pasting from another source without providing any background to the discussion. I suspected that he might have cut and pasted from the Monetary History, but that turned out not to be the case. However, I did find that this paragraph (and probably a lot more] was included in testimony he gave to the Joint Economic Committee. Nearly half of the monetary expansion in the United States came after the end of the war, thanks to the acquiescence of the Federal Reserve System in the Treasury’s desire to avoid a fall in the price of government securities. This expansion, with its accompanying price inflation, led to an outflow of gold despite the great demand for United States goods from a war-ravaged world and despite the departure of most countries from any fixed parity between their currencies and either gold or the dollar. Friedman, usually a very careful writer, refers to “half of the monetary expansion” without identifying in any way “the monetary expansion” that he is referring to, leaving it to the reader to conjecture whether he is talking about the monetary expansion that began with the start of World War I in 1914 or the monetary expansion that began with US entry into the war in 1917 or the monetary expansion associated with some other time period. Friedman then goes on to describe the transition from inflation to deflation. Beginning in late 1919, then more sharply in January 1920 and May 1920, the Federal Reserve System took vigorous deflationary steps that produced first a slackening of the growth of money and then a sharp decline. These brought in their train a collapse in wholesale prices and a severe economic contraction. The near halving of wholesale prices in a twelve month period was by all odds the most rapid price decline ever experienced in the United States before or since. It was not of course confined to the United States but spread to all countries whose money was linked to the dollar either by having a fixed price in terms of gold or by central bank policies directed at maintaining rigid or nearly rigid exchange rates. That is a fair description of what happened after the Fed took vigorous deflationary steps, notably raising its discount rate to 6%. What Friedman neglects to point out is that there was no international gold standard (real or pseudo) immediately after the war, because only the United States was buying and selling gold at a legally established gold parity. Friedman then goes on to compare the pseudo gold standard under which the US was then operating with what would have happened under a real gold standard. Under a real gold standard, the large inflow of gold up to the entry of the United States into the war would have produced a price rise to the end of the war similar to that actually experienced. Now, aside from asserting that under a real gold standard, gold is used as money, and that under a pseudo gold standard, government is engaged in fixing the price of gold, Friedman has not told us how to distinguish between a real and a pseudo gold standard. So it is certainly fair to ask whether in the passage just quoted Friedman meant that the gold standard under which the US was operating when there was a large inflow of gold before entering the war was real or pseudo. His use of the subjunctive verb “would have produced” suggests that he believed that the gold standard was pseudo, not real. But then he immediately says that, under the real gold standard, the “price rise to the end of the war” would have been “similar to that actually experienced.” So take your pick. Evidently, the difference between a real and a pseudo gold standard became relevant only after the war was over. But neither the postwar rise nor the subsequent collapse would have occurred. Instead, there would have been an earlier and milder price decline as the belligerent nations returned to a peacetime economy. The postwar increase in the stock of money occurred only because the Reserve System had been given discretionary power to “manage” the stock of money, and the subsequent collapse occurred only because this power to manage the money had been accompanied by gold reserve requirements as one among several masters the System was instructed to serve. That’s nice, but Friedman has not even suggested, much less demonstrated in any way, how all of this is related to the difference between a real and a pseudo gold standard. Was there any postwar restriction on the buying or selling of gold by private individuals? Friedman doesn’t say. All he can come up with is the idea that the Fed had been given “discretionary power to ‘manage’ the stock of money.” Who gave the Fed this power? And how was this power exercised? He refers to gold reserve requirements, but gold reserve requirements – whether they were a good idea or not is not my concern here — existed before the Fed came into existence. If the Fed had unusual powers after World War I, those powers were not magically conferred by some unidentified entity, but by the circumstance that the US had accumulated about 40% of the world’s monetary gold reserves during World War I, and was the only country, after the war, that was buying and selling gold freely at a fixed price ($20.67 an ounce). The US was therefore in a position to determine the value of gold either by accumulating more gold or by allowing an efflux of gold from its reserves. Whether the US was emitting or accumulating gold depended on the interest-rate policy of the Federal Reserve. It is true that the enormous control the US then had over the value of gold was a unique circumstance in world history, but the artificial and tendentious distinction between a real and a pseudo gold standard has absolutely nothing to do with the inflation in 1919 or the deflation in 1920-21. In the next section Friedman continues his critical review of Fed policy in the 1920s, defending the Fed against the charge (a staple of Austrian Business Cycle Theory and other ill-informed and misguided critics) that it fueled a credit boom during the 1920s. On the contrary, Friedman shows that Fed policy was generally on the restrictive side. I do not myself believe that the 1929-33 contraction was an inevitable result of the monetary policy of the 1920s or even owed much to it. What was wrong was the policy followed from 1929 to 1933. . . . But internationally, the policy was little short of catastrophic. Much has been made of Britain’s mistake in returning to gold in 1925 at a parity that overvalued the pound. I do not doubt that this was a mistake – but only because the United States was maintaining a pseudo gold standard. Had the United States been maintaining a real gold standard, the stock of money would have risen more in the United States than it did, prices would have been stable or rising instead of declining, the United States would have gained less gold or lost some, and the pressure on the pound would have been enormously eased. As it was by sterilizing gold, the United States forced the whole burden of adapting to gold movements on other countries. When, in addition, France adopted a pseudo gold standard at a parity that undervalued the franc and proceeded also to follow a gold sterilization policy, the combined effect was to make Britain’s position untenable. This is actually a largely coherent paragraph, more or less correctly diagnosing the adverse consequences of an overly restrictive policy adopted by the Fed for most of the 1920s. What is not coherent is the attempt to attribute policy choices of which Friedman (and I) disapprove to the unrealness of the gold standard. There was nothing unreal about the gold standard as it was operated by the Fed in the 1920s. The Fed stood ready to buy and sell gold at the official price, and Friedman does not even suggest that there was any lapse in that commitment. So what was the basis for Friedman’s charge that the 1920s gold standard was fake or fraudulent? Friedman says that if there had been a real, not a pseudo, gold standard, “the stock of money would have risen more in the United States than it did, prices would have been stable or rising instead of declining,” and the US “would have gained less gold or lost some.” That this did not happen, Friedman attributes to a “gold sterilization policy” followed by the US. Friedman is confused on two levels. First, he seems to believe that the quantity of money in the US was determined by the Fed. However, under a fixed-exchange-rate regime, the US money supply was determined endogenously via the balance of payments. What the Fed could determine by setting its interest rate was simply whether gold would flow into or out of US reserves. The level of US prices was determined by the internationally determined value of gold. Whether gold was flowing into or out of US reserves, in turn, determined the value of gold was rising or falling, and, correspondingly, whether prices in terms of gold were falling or rising. If the Fed had set interest rates somewhat lower than they did, gold would have flowed out of US reserves, the value of gold would have declined and prices in terms of gold would have risen, thereby easing deflationary pressure on Great Britain occasioned by an overvalued sterling-dollar exchange rate. I have no doubt that the Fed was keeping its interest rate too high for most of the 1920s, but why a mistaken interest-rate policy implies a fraudulent gold standard is not explained. Friedman, like his nemesis von Mises, simply asserted his conclusion or his definition, and expected his listeners and readers to nod in agreement. In this section Friedman undertakes his now familiar excoriation of Fed inaction to alleviate the banking crises that began in September 1931 and continued till March 1933. Much, if not all, of Friedman’s condemnation of the Fed is justified, though his failure to understand the international nature of the crisis caused him to assume that the Fed could have prevented a deflation caused by a rising value of gold simply by preventing bank failures. There are a number of logical gaps in that argument, and Friedman failed to address them, simply assuming that US prices were determined by the US money stock even though the US was still operating on the gold standard and the internationally determined value of gold was rising. Prior to September 1931, the System had been gaining gold, the monetary gold stock was at an all-time high, and the System’s gold reserve ratio was far above its legal minimum – a reflection of course of its not having operated in accordance with a real gold standard. Again Friedman is saying that the criterion for identifying whether the gold standard is real or fraudulent is whether policy makers make the correct policy decision, if they make a mistake, it means that the gold standard in operation is no longer a real gold standard; it has become a pseudo gold standard. The System had ample reserves to meet the gold outflow without difficulty and without resort to deflationary measures. And both its own earlier policy and the classical gold-standard rules as enshrined by Bagehot called for its doing so: the gold outflow was strictly speculative and motivated by fear that the United States would go off gold; the outflow had no basis in any trade imbalance; it would have exhausted itself promptly if all demands had been met. Thus, Friedman, who just three pages earlier had asserted that the gold standard became a pseudo gold standard when the managers of the Federal Reserve System were given discretionary powers to manage the stock of money, now suggests that a gold standard can also be made a pseudo gold standard if the monetary authority fails to exercise its discretionary powers. The nationalization of gold by FDR effectively ended the gold standard in the US. Nevertheless, Friedman was so enamored of the distinction between real and pseudo gold standards that he tried to portray US monetary arrangements after the nationalization of gold as a pseudo gold standard even though the gold standard had been effectively nullified. But at least, the distinction between what is real and what is fraudulent about the gold standard is now based on an objective legal and institutional fact: the general right to buy gold from (or sell gold to) the government at a fixed price whenever government offices are open for business. Similarly after World War II, only the US government had any legal obligation to sell gold at the official price, but there was only a very select group of individuals and governments who were entitled to buy gold from the US government. Even to call such an arrangement a pseudo gold standard seems like a big stretch, but there is nothing seriously wrong with calling it a pseudo gold standard. But I have no real problem with Friedman’s denial that there was a true gold standard in operation after the nationalization of gold in 1934. I would also agree that there really was not a gold standard in operation after the US entered World War I, because the US stopped selling gold after the War started. In fact, a pseudo gold standard is a good way to characterize the status of the gold standard during World War I, because the legal price of gold was not changed in any of the belligerent countries, but it was understood that for a private citizen to try to redeem currency for gold at the official price would be considered a reprehensible act, something almost no one was willing to do. But to assert, as Friedman did, that even when the basic right to buy gold at the official price was routinely exercised, a real gold standard was not necessarily in operation, is simply incoherent, or sophistical. Take your pick. Lately, I have been reading a paper by Roger Backhouse and David Laidler, “What Was Lost with IS-LM” (an earlier version is available here) which was part of a very interesting symposium of 11 papers on the IS-LM model published as a supplement to the 2004 volume of History of Political Economy. The main thesis of the paper is that the IS-LM model, like the General Theory of which it is a partial and imperfect distillation, aborted a number of promising developments in the rapidly developing, but still nascent, field of macroeconomics in the 1920 and 1930s, developments that just might, had they not been elbowed aside by the IS-LM model, have evolved into a more useful and relevant theory of macroeconomic fluctuations and policy than we now possess. Even though I have occasionally sparred with Scott Sumner about IS-LM – with me pushing back a bit at Scott’s attacks on IS-LM — I have a lot of sympathy for the Backhouse-Laidler thesis. The Backhouse-Laidler paper is too long to summarize, but I will just note that there are four types of loss that they attribute to IS-LM, which are all, more or less, derivative of the static equilibrium character of Keynes’s analytic method in both the General Theory and the IS-LM construction. 1 The loss of dynamic analysis. IS-LM is a single-period model. 2 The loss of intertemporal choice and expectations. Intertemporal choice and expectations are excluded a priori in a single-period model. 3 The loss of policy regimes. In a single-period model, policy is a one-time affair. The problem of setting up a regime that leads to optimal results over time doesn’t arise. 4 The loss of intertemporal coordination failures. Another concept that is irrelevant in a one-period model. [A]lthough [Keynes] made many remarks that could be (and in some cases were later) turned into dynamic models, the emphasis of the General Theory was nevertheless on unemployment as an equilibrium phenomenon. Keynes’s theoretical system . . . is equally “old-fashioned” in the second respect which characterizes recent economic theory – namely, the attempt to break away from an explanation of economic events by means of orthodox equilibrium constructions. No other analysis of trade fluctuations in recent years – with the possible exception of the Mises-Hayek school – follows such conservative lines in this respect. In fact, Keynes is much more of an “equilibrium theorist” than such economists as Cassel and, I think, Marshall. Before becoming Governor of the Resesrve Bank of India, Raghuram Rajan professor was Professor of Finance at the University of Chicago Business School. Winner of the Fischer Black Prize in 2003, he is the author numerous articles in leading academic journals in economics and finance, and co-author (with Luigi Zingales) of a well-regarded book Saving Capitalism from the Capitalists that had some valuable insights about financial-market dysfunction. He is obviously no slouch. Unfortunately, based on recent reports, Goverenor Rajan is, despite his impressive resume and academic credentials, as Marcus Nunes pointed out on his blog, totally clueless about the role of monetary policy and the art of central banking in combating depressions. Here is the evidence provided by none other than the Wall Street Journal, a newspaper whose editorial page espouses roughly the same view as Rajan, summarizing Rajan’s remarks. Reserve Bank of India Governor Raghuram Rajan warned Wednesday that the global economy bears an increasing resemblance to its condition in the 1930s, with advanced economies trying to pull out of the Great Recession at each other’s expense. The difference: competitive monetary policy easing has now taken the place of competitive currency devaluations as the favored tool for playing a zero-sum game that is bound to end in disaster. Now, as then, “demand shifting” has taken the place of “demand creation,” the Indian policymaker said. A clear symptom of the major imbalances crippling the world’s financial market is the over valuation of the euro, Mr. Rajan said. The euro-zone economy faces problems similar to those faced by developing economies, with the European Central Bank’s “very, very accommodative stance” having a reduced impact due to the ultra-loose monetary policies being pursued by other central banks, including the Federal Reserve, the Bank of Japan and the Bank of England. The notion that competitive currency devaluations in the Great Depression were a zero-sum game is fallacy, an influential fallacy to be sure, but a fallacy nonetheless. And because it is – and was — so influential, it is a highly dangerous fallacy. There is indeed a similarity between the current situation and the 1930s, but the similarity is not that monetary ease is a zero-sum game that merely “shifts,” but does not “create,” demand; the similarity is that the fallacious notion that monetary ease does not create demand is still so prevalent. The classic refutation of the fallacy that monetary ease only shifts, but does not create, demand was provided on numerous occasions by R. G. Hawtrey. Almost two and a half years ago, I quoted a particularly cogent passage from Hawtrey’s Trade Depression and the Way Out (2nd edition, 1933) in which he addressed the demand-shift fallacy. Hawtrey refuted the fallacy in responding to those who were arguing that Britain’s abandonment of the gold standard in September 1931 had failed to stimulate the British economy, and had damaged the world economy, because prices continued falling after Britain left the gold standard. Hawtrey first discussed the reasons for the drop in the world price level after Britain gave up the gold standard. When Great Britain left the gold standard, deflationary measures were everywhere resorted to. Not only did the Bank of England raise its rate, but the tremendous withdrawals of gold from the United States involved an increase of rediscounts and a rise of rates there, and the gold that reached Europe was immobilized or hoarded. . . . In other words, Britain’s departure from the gold standard led to speculation that the US would follow Britain off the gold standard, implying an increase in the demand to hoard gold before the anticipated increase in its dollar price. That is a typical reaction under the gold standard when the probability of a devaluation is perceived to have risen. By leaving gold, Britain increased the perceived probability that other countries, and especially the US, would also leave the gold standard. The consequence was that the fall in the price level continued [because an increase in the demand to hold gold (for any reason including speculation on a future increase in the nominal price of gold) must raise the current value of gold relative to all other commodities which means that the price of other commodities in terms of gold must fall — DG]. The British price level rose in the first few weeks after the suspension of the gold standard [because the value of the pound was falling relative to gold, implying that prices in terms of pounds rose immediately after Britain left gold — DG], but then accompanied the gold price level in its downward trend [because after the initial fall in the value of the pound relative to gold, the pound stabilized while the real value of gold continued to rise — DG]. This fall of prices calls for no other explanation than the deflationary measures which had been imposed [alarmed at the rapid fall in the value of gold, the Bank of England raised interest rates to prevent further depreciation in sterling — DG]. Indeed what does demand explanation is the moderation of the fall, which was on the whole not so steep after September 1931 as before. Here Hawtrey identified precisely the demand-shift fallacy evidently now subscribed to by Governor Rajan. In other words, when Britain left the gold standard, Britain did nothing to raise the international level of prices, which, under the gold standard, is the level of prices measured in terms of gold. Britain may have achieved a slight increase in its own domestic price level, but only by imposing a corresponding reduction in the price level measured in terms of gold. Let’s see how Hawtrey demolishes the fallacy. For any such conclusion there was no foundation. Whenever the gold price level tended to fall, the tendency would make itself felt in a fall in the pound concurrently with the fall in commodities. [Hawtrey is saying that if the gold price level fell, while the sterling price level remained constant, the value of sterling would also fall in terms of gold. — DG] But it would be quite unwarrantable to infer that the fall in the pound was the cause of the fall in commodities. Hawtrey then articulates the policy implication of the demand-shift fallacy. This competitive depreciation is an entirely imaginary danger. The benefit that a country derives from the depreciation of its currency is in the rise of its price level relative to its wage level, and does not depend on its competitive advantage. [There is a slight ambiguity here, because Hawtrey admitted above that there is a demand shift. But there is also an increase in demand, and it is the increase in demand, associated with a rise of its price level relative to its wage level, which does not depend on a competitive advantage associated with a demand shift. — DG] If other countries depreciate their currencies, its competitive advantage is destroyed, but the advantage of the price level remains both to it and to them. They in turn may carry the depreciation further, and gain a competitive advantage. But this race in depreciation reaches a natural limit when the fall in wages and in the prices of manufactured goods in terms of gold has gone so far in all the countries concerned as to regain the normal relation with the prices of primary products. When that occurs, the depression is over, and industry is everywhere remunerative and fully employed. Any countries that lag behind in the race will suffer from unemployment in their manufacturing industry. But the remedy lies in their own hands; all they have to do is to depreciate their currencies to the extent necessary to make the price level remunerative to their industry. Their tardiness does not benefit their competitors, once these latter are employed up to capacity. Indeed, if the countries that hang back are an important part of the world’s economic system, the result must be to leave the disparity of price levels partly uncorrected, with undesirable consequences to everybody. . . .
Hawtrey’s analysis of competitive depreciation can be further elucidated by reconsidering it in the light of Max Corden’s classic analysis of exchange-rate protection, which I have discussed several times on this blog (here, here, and here). Corden provided a deep analysis of the conditions under which exchange-rate depreciation confers a competitive advantage. For internationally traded commodities, it is hard to see how any advantage can be derived from currency manipulation. A change in the exchange rate would be rapidly offset by corresponding changes in the prices of the relevant products. However, factors of production like labor, land, and capital equipment, tend to be immobile so their prices in the local currency don’t necessarily adjust immediately to changes in exchange rate of the local currency. Hawtrey was clearly assuming that labor and capital are not tradable so that international arbitrage does not induce immediate adjusments in their prices. Also, Hawtrey’s analysis begins from a state of disequilibrirum, while Corden’s starts from equilibrium, a very important difference. However, even if prices of non-tradable commodities and factors of production don’t immediately adjust to exchange-rate changes, there is another mechanism operating to eliminate any competitive advantage, which is that the inflow of foreign-exchange reserves into a country with an undervalued currency (and, thus, a competitive advantage) will normally induce monetary expansion in that country, thereby raising the prices of non-tradables and factors of production. What Corden showed was that a central bank willing to tolerate a sufficiently large expansion in its foreign-reserve holdings could keep its currency undervalued, thereby maintaining a competitive advantage for its country in world markets. But the corollary to Corden’s analysis is that to gain competitive advantage from currency depreciation requires the central bank to maintain monetary stringency (a chronic excess demand for money thus requiring a corresponding export surplus) and a continuing accumulation of foreign exchange reserves. If central banks are pursuing competitive monetary easing, which Governor Rajan likens to competitive exchange-rate depreciation aimed at shifting, not expanding, total demand, he is obviously getting worked up over nothing, because Corden demonstrated 30 years ago that a necessary condition for competitive exchange-rate depreciation is monetary tightness, not monetary ease. In my previous post, I tried to explain how to think about own rates of interest. Unfortunately, I made a careless error in calculating the own rate of interest in the simple example I constructed to capture the essence of Sraffa’s own-rate argument against Hayek’s notion of the natural rate of interest. But sometimes these little slip-ups can be educational, so I am going to try to turn my conceptual misstep to advantage in working through and amplifying the example I presented last time. But before I reproduce the passage from Sraffa’s review that will serve as our basic text in this post as it did in the previous post, I want to clarify another point. The own rate of interest for a commodity may be calculated in terms of any standard of value. If I borrow wheat and promise to repay in wheat, the wheat own rate of interest may be calculated in terms of wheat or in terms of any other standard; all of those rates are own rates, but each is expressed in terms of a different standard. In principle, there is a separate own rate of interest for every commodity and for every numeraire. If there are n commodities, there are n potential numeraires, and n own rates can be expressed in terms of each numeraire. So there are n-squared own rates. Each own rate can be thought of as equilibrating the demand for loans made in terms of a given commodity and a given numeraire. But arbitrage constraints tightly link all these separate own rates together. If it were cheaper to borrow in terms of one commodity than another, or in terms of one numeraire than another, borrowers would switch to the commodity and numeraire with the lowest cost of borrowing, and if it were more profitable to lend in terms of one commodity, or in terms of one numeraire, than another, lenders would switch to lending in terms of the commodity or numeraire with the highest return. Thus, competition tends to equalize own rates across all commodities and across all numeraires. Of course, perfect arbitrage requires the existence of forward markets in which to contract today for the purchase or sale of a commodity at a future date. When forward markets don’t exist, some traders may anticipate advantages to borrowing or lending in terms of particular commodities based on their expectations of future prices for those commodities. The arbitrage constraint on the variation of interest rates was discovered and explained by Irving Fisher in his great work Appreciation and Interest. I pause to make a subtle, but, I think, an important, point. Although the relationship between the spot and the forward price of any commodity tightly constrains the own rate for that commodity, the spot/forward relationship does not determine the own rate of interest for that commodity. There is always some “real” rate reflecting a rate of intertemporal exchange that is consistent with intertemporal equilibrium. Given such an intertemporal rate of exchange — a real rate of interest — the spot/forward relationship for a commodity in terms of a numeraire pins down the own rate for that commodity in terms of that numeraire. Sraffa correctly noted that arbitrage would force the terms of such a loan (i.e., the own rate of interest) to equal the ratio of the current forward price of the commodity to its current spot price, buying spot and selling forward being essentially equivalent to borrowing and repaying. That statement now seems quite wrong to me. Sraffa did not assert that arbitrage would force the own rate of interest to equal the ratio of the spot and forward prices. He merely noted that in a stationary equilibrium with equality between all spot and forward prices, all own interest rates would be equal. I criticized him for failing to note that in a stationary equilibrium all own rates would be zero. The conclusion that all own rates would be zero in a stationary equilibrium might in fact be valid, but if it is, it is not as obviously valid as I suggested, and my criticism of Sraffa and Ludwig von Mises for not drawing what seemed to me an obvious inference was not justified. To conclude that own rates are zero in a stationary equilibrium, you would, at a minimum, have to show that there is at least one commodity which could be carried from one period to the next at a non-negative profit. Sraffa may have come close to suggesting such an assumption in the passage in which he explains how borrowing to buy cotton spot and immediately selling cotton forward can be viewed as the equivalent of contracting a loan in terms of cotton, but he did not make that assumption explicitly. In any event, I mistakenly interpreted him to be saying that the ratio of the spot and forward prices is the same as the own interest rate, which is neither true nor what Sraffa meant. And now let’s finally go back to the key quotation of Sraffa’s that I tried unsuccessfully to parse in my previous post. In my previous post I tried to flesh out Sraffa’s example by supposing that, in the stationary equilibrium before the demand shift, tomatoes and cucumbers were both selling for a dollar each. In a stationary equilibrium, tomato and cucumber prices would remain, indefinitely into the future, at a dollar each. A shift in demand from tomatoes to cucumbers upsets the equilibrium, causing the price of tomatoes to fall to, say, $.90 and the price of cucumbers to rise to, say, $1.10. But Sraffa also argued that the prices of tomatoes and cucumbers would diverge only temporarily from their equilibrium values, implicitly assuming that the long-run supply curves of both tomatoes and cucumbers are horizontal at a price of $1 per unit. I misunderstood Sraffa to be saying that the ratio of the future price and the spot price of tomatoes equals one plus the own rate on tomatoes. I therefore incorrectly calculated the own rate on tomatoes as 1/.9 minus one or 11.1%. There were two mistakes. First, I incorrectly inferred that equality of all spot and forward prices implies that the real rate must be zero, and second, as Nick Edmunds pointed out in his comment, a forward price exceeding the spot price would actually be reflected in an own rate less than the zero real rate that I had been posited. To calculate the own rate on tomatoes, I ought to have taken the ratio of spot price to the forward price — (.9/1) — and subtracted one plus the real rate. If the real rate is zero, then the implied own rate is .9 minus 1, or -10%. To see where this comes from, we can take the simple algebra from Fisher (pp. 8-9). Let i be the interest rate calculated in terms of one commodity and one numeraire, and j be the rate of interest calculated in terms of a different commodity in that numeraire. Further, let a be the rate at which the second commodity appreciates relative to the first commodity. We have the following relationship derived from the arbitrage condition. Now in our case, we are trying to calculate the own rate on tomatoes given that tomatoes are expected (an expectation reflected in the forward price of tomatoes) to appreciate by 10% from $.90 to $1.00 over the term of the loan. To keep the analysis simple, assume that i is zero. Although I concede that a positive real rate may be consistent with the stationary equilibrium that I, following Sraffa, have assumed, a zero real rate is certainly not an implausible assumption, and no important conclusions of this discussion hinge on assuming that i is zero. To apply Fisher’s framework to Sraffa’s example, we need only substitute the ratio of the forward price of tomatoes to the spot price — [p(fwd)/p(spot)] — for the appreciation factor (1 + a). (1 + i) = (1 + j) [p(fwd)/p(spot)]. [p(spot)/p(fwd)] (1 + i) = (1 + j). [p(spot)/p(fwd)] = (1 + j). j = [p(spot)/p(fwd)] – 1. If the ratio of the spot to the forward price is .9, then the own rate on tomatoes, j, equals -10%. 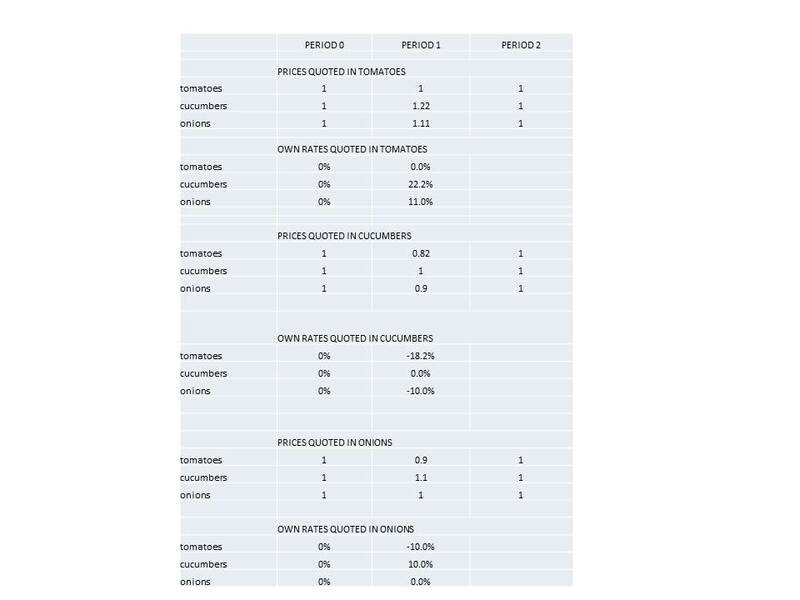 My assertion in the previous post that the own rate on cucumbers would be negative by the amount of expected depreciation (from $1.10 to $1) in the next period was also backwards. The own rate on cucumbers would have to exceed the zero equilibrium real rate by as much as cucumbers would depreciate at the time of repayment. So, for cucumbers, j would equal 11%. Just to elaborate further, let’s assume that there is a third commodity, onions, and that, in the initial equilibrium, the unit prices of onions, tomatoes and cucumbers are equal. If the demand shift from tomatoes to cucumbers does not affect the demand for onions, then, even after the shift in demand, the price of onions will remain one dollar per onion. The table below shows prices and own rates for tomatoes, cucumbers and onions for each possible choice of numeraire. If prices are quoted in tomatoes, the price of tomatoes is fixed at 1. Given a zero real rate, the own rate on tomatoes in period is zero. What about the own rate on cucumbers? In period 0, with no change in prices expected, the own rate on cucumbers is also zero. However in period 1, after the price of cucumbers has risen to 1.22 tomatoes, the own rate on cucumbers must reflect the expected reduction in the price of a cucumber in terms of tomatoes from 1.22 tomatoes in period 1 to 1 tomato in period 2, a price reduction of 22% percent in terms of tomatoes, implying a cucumber own rate of 22% in terms of tomatoes. Similarly, the onion own rate in terms of tomatoes would be 11% percent reflecting a forward price for onions in terms of tomatoes 11% below the spot price for onions in terms of tomatoes. If prices were quoted in terms of cucumbers, the cucumber own rate would be zero, and because the prices of tomatoes and onions would be expected to rise in terms of cucumbers, the tomato and onion own rates would be negative (-18.2% for tomatoes and -10% for onions). 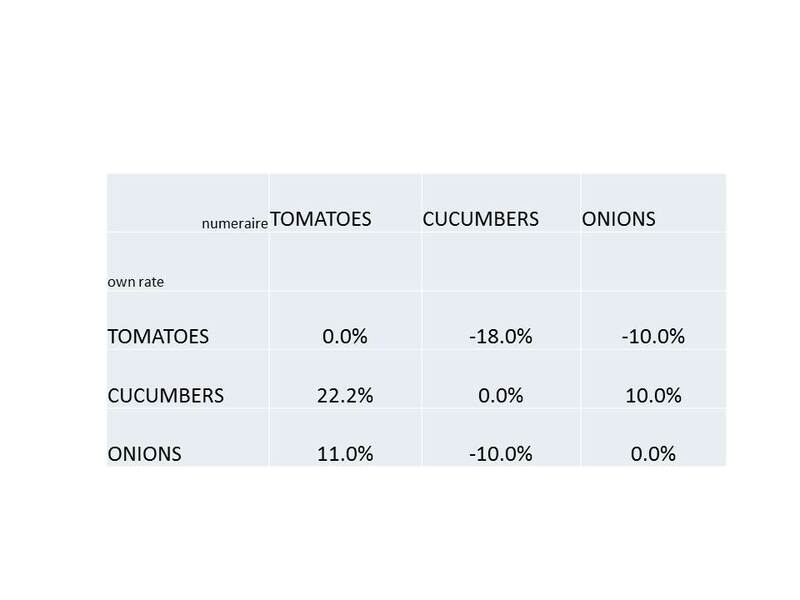 And if prices were quoted in terms of onions, the onion own rate would be zero, while the tomato own rate, given the expected appreciation of tomatoes in terms of onions, would be negative (-10%), and the cucumber own rate, given the expected depreciation of cucumbers in terms of onions, would be positive (10%). The next table, summarizing the first one, is a 3 by 3 matrix showing each of the nine possible combinations of numeraires and corresponding own rates. Thus, although the own rates of the different commodities differ, and although the commodity own rates differ depending on the choice of numeraire, the cost of borrowing (and the return to lending) is equal regardless of which commodity and which numeraire is chosen. As I stated in my previous post, Sraffa believed that, by showing that own rates can diverge, he showed that Hayek’s concept of a natural rate of interest was a nonsense notion. However, the differences in own rates, as Fisher had already showed 36 years earlier, are purely nominal. The underlying real rate, under Sraffa’s own analysis, is independent of the own rates. Moreover, as I pointed out in my previous post, though the point was made in the context of a confused exposition of own rates, whenever the own rate for a commodity is negative, there is an incentive to hold it now for sale in the next period at a higher price it would fetch in the current period. It is therefore only possible to observe negative own rates on commodities that are costly to store. Only if the cost of holding a commodity is greater than its expected appreciation would it not be profitable to withhold the commodity from sale this period and to sell instead in the following period. The rate of appreciation of a commodity cannot exceed the cost of storing it (as a percentage of its price). What do I conclude from all this? That neither Sraffa nor Hayek adequately understood Fisher. Sraffa seems to have argued that there would be multiple real own rates of interest in disequilibrium — or at least his discussion of own rates seem to suggest that that is what he thought — while Hayek failed to see that there could be multiple nominal own rates. Fisher provided a definitive exposition of the distinction between real and nominal rates that encompasses both own rates and money rates of interest. A. C. Pigou, the great and devoted student of Alfred Marshall, and ultimately his successor at Cambridge, is supposed to have said “It’s all in Marshall.” Well, one could also say “it’s all in Fisher.” Keynes, despite going out of his way in Chapter 12 of the General Theory to criticize Fisher’s distinction between the real and nominal rates of interest, actually vindicated Fisher’s distinction in his exposition of own rates in Chapter 17 of the GT, providing a valuable extension of Fisher’s analysis, but apparently failing to see the connection between his discussion and Fisher’s, and instead crediting Sraffa for introducing the own-rate analysis, even as he undermined Sraffa’s ambiguous suggestion that real own rates could differ. Go figure.